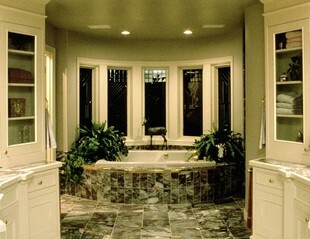 You are here: Home Bathroom Designs Which Bathroom Design Works Best For You? There are an infinite number of different bathroom designs that can be implemented in a home, but many of the bathroom designs have similar elements that allow them to be groups into a specific category. Often, the overall design of the bathroom depends on the size of the room and the style of the bathroom fixtures that are placed within the room. Homeowners have many different options when it comes to a bathroom design and the ultimate decision will hinge on what the homeowner wants, needs, and can afford. The biggest decision to be made about the bathroom design is what types of bathroom fixtures should be placed in the bathroom area. Questions about whether to have separate shower and tub areas or to go with a more traditional set-up, whether all of the fixtures in the bathroom should match exactly or to go with a more eclectic look, and whether the faucets should be gray or gold are some of the decisions that will take up the most amount of time when deciding what bathroom design to choose. There are many manufactures that create bathroom fixtures in sets or series so that a homeowner can choose the pieces that they desire without having to purchase the entire bathroom set. Another decision that will have to be made is which colors should be used in the bathroom design. Bright and light colors on the walls have the ability to open up smaller areas and bold colors can be used as accents in the room to draw the eye. In larger bathroom areas, the colors that are used in the design are not as important as darker colors will still allow the room to feel more spacious than claustrophobic to the individuals using it. If the homeowner or a member of the family has physical limitations, that should be taken into account for the bathroom design as well. There have been many different types of bathroom fixtures created to help individuals that have physical limitations be more independent and many of these designs are indistinguishable from other types of bathroom fixtures that may be found in other homes. Whether it is a short step to help an individual get into the bath tub or a bar in the shower for stabilization, modifications made to a bathroom for the comfort of a individual with physical limitation are worth the cost – every time.